Mike Gillis is DMJ’s managing partner and helps privately-held businesses and their owners achieve their long-term financial goals with proactive planning. He is a frequent presenter on tax matters and works extensively in the area of succession and exit planning strategies for businesses. Mike is originally from Pennsylvania. He attended Thiel College in Pennsylvania and graduated in 1982 with a Bachelor of Arts Degree in Accounting and Business Administration, and became a CPA in 1984. 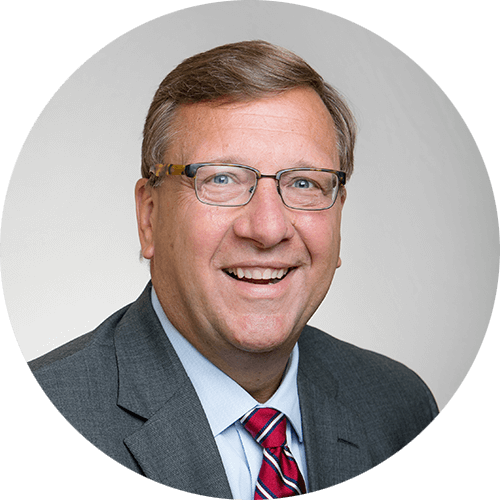 After college, Mike joined a regional CPA firm in Youngstown, Ohio, before selecting North Carolina as his home. He continued his work experience with another Greensboro firm prior to joining DMJ in 1987. As manager of DMJ’s Tax Division, Mike supervised all aspects, including corporate and individual returns, tax planning and research, employee benefits plans, estate and succession planning, and representation before the Internal Revenue Service. Mike became a tax partner in the firm on November 1, 1991. On November 1, 1997, he became the firm-wide managing partner. He has earned the AICPA designation of Personal Financial Specialist which entails his combination of extensive tax expertise and comprehensive knowledge of financial planning. He was also a member of the CPAmerica International Board of Directors from in 2008, served as Chairman. Mike was actively involved in his children’s high school sports and had served as president of the Western Guilford High School Boosters Club.